The final brace is attached to the loggerhead sea turtle's shell using marine-grade turtle-safe epoxy. 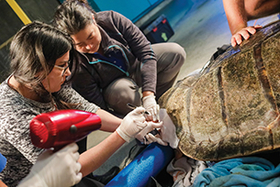 An injured sea turtle found in the cooling canal of a New Jersey power plant in 2013 is now growing and thriving at a California aquarium with a bit of help from UC San Diego's Thornton Pavilion. Staff at the Birch Aquarium at the University of California at San Diego collaborated with the digital media laboratory at the university's Geisel Library to design, build and attach a 3-D printed brace that fills a gap in the bottom right part of the loggerhead sea turtle's shell. The lab's 3-D scans identified possible design solutions, and CT scans performed at what was then called Thornton Hospital have been used to monitor changes in the shell as she grows. The brace, combined with a neoprene weight pocket, is expected to let her grow and thrive in the protected environment of the aquarium. The Marine Mammal Stranding Center in Brigantine, N.J., made initial recovery efforts, but she eventually was moved to Birch Aquarium after it offered its services, secured necessary federal approvals and raised more than $50,000 for the turtle's housing and rehabilitative care. The turtle weighed 74.5 pounds on arrival at Birch Aquarium in November 2014. Since then, she has gained more than 130 pounds. As the turtle grows potentially to 250 pounds, she will outgrow the brace and be fitted for a larger one.